Western Baby Bib: Get two chic looks in one with our posh, reversible bibs. These darling oversized bibs are absorbent to catch every spill and splatter, but still show off your little one’s fun personality! The unique hourglass shape lets baby’s arms move freely to grab every last morsel on his plate! We’ve added a hidden Velcro closure for convenient and easy removal. 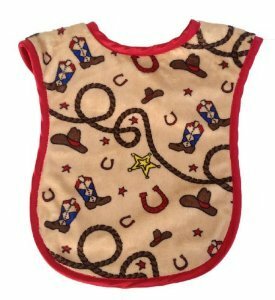 Each bib is adorned with a soft, color-coordinated trim for ultimate dining comfort. Just toss in the wash for a hassle-free clean up and your little one’s outfit is as good as new!